So, you are the proud owner of a brand new Yixing tea pot. What now? A step by step guide on how to season a purple sand claypot or remove mould. 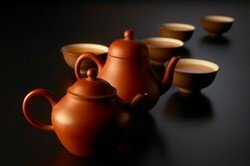 Most experienced tea connoisseurs recommend that you season your clay tea pot for best results. Your tea pot will season itself over time with a thin coating of tea, but you can speed up this natural process and begin enjoying the flavor-enhancing properties of a properly seasoned pot right away. First, give your tea pot a good rinse to remove any dust or other residues from manufacturing and shipping. Now, you are ready to get started! Place the pot and lid in a large pot and fill it with water. Make sure the pot is big enough so that the water can completely cover the tea pot. To protect your tea pot while it is in the pot, cushion it on a natural-fiber kitchen towel. Slowly bring the water to a boil. Turn the heat down, and let the tea pot simmer for an hour. Turn off the heat. Allow the water to cool completely before you remove the tea pot. Put the tea pot back in the pot and fill it with water again. Slowly heat the water just until it comes to a boil. Now, take the pot off the stove and add some tea leaves of the same variety you’ll be drinking in this tea pot. If the pot has been selected for a particularly high quality grade of tea, it is important to avoid seasoning with a lower grade. The new pot will quickly absorb flavor characteristics, and a low quality tea may permanently affect the pot's performance. From here, there are two procedures you can follow. If you are very patient, you can cover your pot with plastic wrap and let it sit for a week. If you are less patient, just let it marinate in the tea for 24 hours. After the time is up, take the tea pot out and rinse with cool water. You are now ready to start brewing tea in your new Yixing tea pot! Remove used leaves from your pot promptly after each use. Otherwise, you could end up with mould! If this does happen, your may want to get rid of the tea pot. Rinse all the old tea and tea leaves out of the pot. Wash the inside gently with a baking soda paste to dislodge any stuck bits of gunk and rinse. Check the inside - make sure there is no mould growing. If there isn’t, pour vinegar inside the tea pot and let it sit overnight. This will clean and deodorize. The next day, pour the vinegar out, rinse the tea pot well, and re-season as described above.